Oz Safari: Stage 7 – FUN FINISH, 14th place overall! All finished! 2 specials and then 2 short super specials. Total result 14th general, time 34:35:45. So happy!!! Congratulations to the winner Todd Smith, who now claimed the victory ahead of his brother Jake Smith (who did Dakar 2011). Two years ago it was the other way around. And also congrats to third Rod Faggoter, who will go Dakar 2012 with Team Husaberg! Great event, I didn’t think I’d finish this high in the result. It’s been the toughest starting field in years… And this time I am almost unscratched. And I’m the best international rider 😉 yeeaaah! This was my 20th rally and the 20th I finished – keeping up my statistics 100%! It is even a greater record than my 14th position. The tracks were difficult with sand, stones, tall grass, deep ruts and hidden obstacles… yet the speed was very fast. I rode carefully and attentively, still fell a few times, but luckily got no severe injuries. Just a tiny scratch on my elbow. It has been very tough, many competitors had accidents and about half of them couldn’t make it all the way. Big thanks to team Husaberg Australia, and especially Garry Connell for putting the team together. My thoughts are with poor Garry who had a bad crash yesterday – still in hospital (get well soon). Also to my friend and now rookie mechanic Rikard “Eppis” Epstein, who never has worked on bikes before and was thrown into this only 2 weeks before start. More on thanks to the entire Safari Organisation and all officialls at checkpoints and time controls etc, for arranging this great event. And last, thanks to all my fellow competitors for contributing to a great spirit out here – it’s been so fun racing with you (even if I HATE the dust some of you make… thinking of the two KTM 950, #75 and #89 that I’ve been having a great time with). All the results are on the Australasian Safari website. Oh dear … is this a girl who got lost in a rally!!?? Not me! 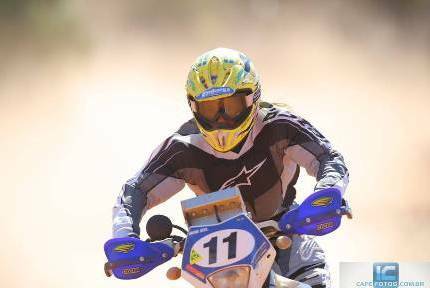 This entry was posted in 2011, Australasian Safari, Dakar, Rally and tagged 2011, Annie Seel, australasian, australia, bike, Finish, husaberg, safari. 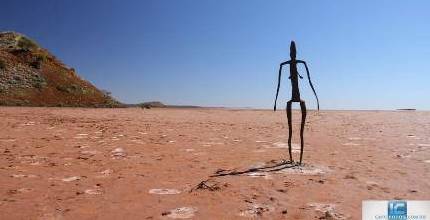 Oz Safari: Stage 6 – Rough and hard. Nothing easy about today’s stage. Fast and then very technical in rocks altered with winding tight soft sandy trails and deeply rutted creek crossing. My hands, wrists and most of all the right thumb are really aching now, so really just holding on to the bike and wrestling it around tight corners is hard work. I rode accordingly at very moderate pace not to get into trouble, but still dropped it twice in soft sandy creek. Some had more bad luck… I found a few of my team mates had problems: Sam #10 burt clutch, and team boss Garry #14 had a really bad crash injuring his shoulder and cracking some ribs. Also super starCyril Depres unfortunately hit his foot and chose to withdraw. By riding consistently every day I have now moved up to 15th general! Sweden’s Annie Seel who is Safari’s only female moto competitor is the leading international entrant. She said it had been a long week. “This morning and yesterday also I was in cruise mode, which isn’t too good. I let a couple of guys pass me and then I switched on and started to push. Today we had very good stages. I broke my thumb two years ago and it’s sore again now, and of course I’m tired! I was thinking about it, and it really is a tough seven days,” she said. This entry was posted in Dakar and tagged 2011, Annie Seel, australasian, rally. Great event. Here is a great video from Transmoto. 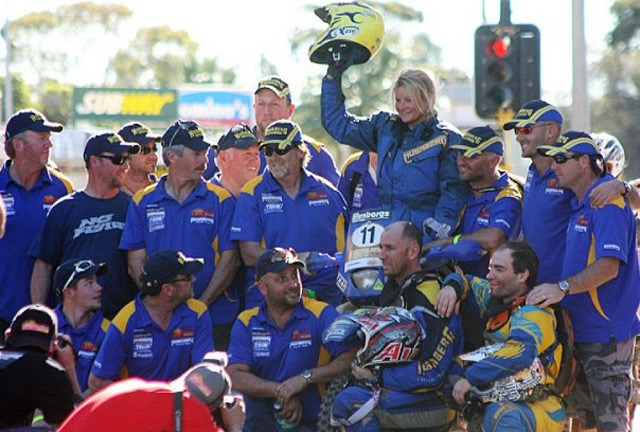 This entry was posted in 2010 and tagged Annie Seel, australasian, competition, Finish, garry connell, husaberg, motorsport, rally, rally dakar, safari. 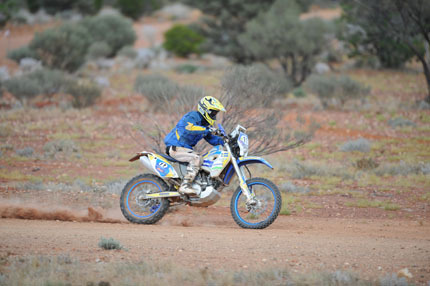 Now officially signed up for Team Husaberg Australia in the Australasian Safari Rally in sept! I am soooo happy to go again and race the #11 Husaberg 570! Thanks Garry Connell (team boss) – for everything you put into this! 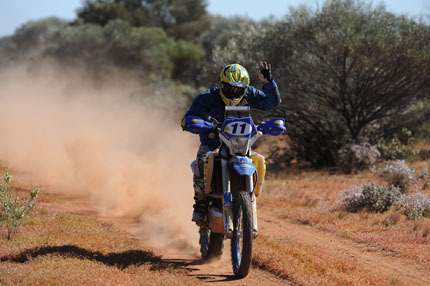 This entry was posted in 2010 and tagged australasian, garry connell, husaberg, safari.